Book your tickets online to get the best price. Tickets are on sale now for all Giants home games in 2018/19. Are you coming to watch the Giants for the first time? Check out our First Time Fan page for all the information you need about gameday. No physical tickets are issued – simply turn up to the ticket desk on match day with your email confirmation, either printed out or by showing on your phone and you’ll be cross-referenced with our ticket list and given entry to the venue. Friday games tip-off at 7.30pm, Sunday games tip-off at 5pm. Doors open an hour before tip-off. 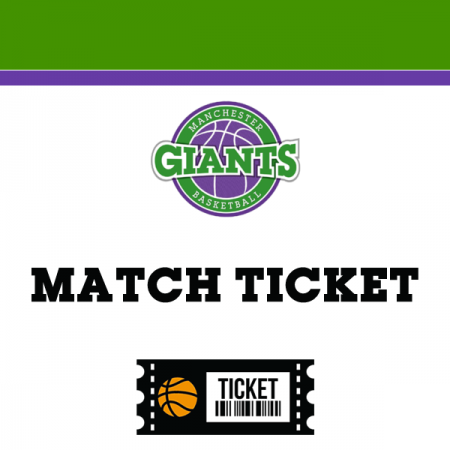 Guarantee your place at all Giants home games in 2018/19 by purchasing a season ticket. A season ticket includes all home BBL Championship, BBL Cup and BBL Trophy matches and the annual pre-season clash against USA Select. What ticket type should I buy? **for season tickets, must be 16 or under on 1st September 2017. I am registered disabled, what type of ticket does my carer need to buy? Carers are eligible to enter the match for free, as long as you have bought a concession ticket for yourself. If you have any special requirements or may require any assistance on the match night itself, please contact the club in advance. Doors open an hour before tip-off – so usually 4pm for Sunday matches, and 6.30pm for Friday night matches. We don’t send out physical tickets. Your name will be added to the ticket list. No. We have bleacher seater at the venue and it is first come, first served. For the best seats, we advise arriving early. If you have any specific requirements, or want to ensure a large group can sit together, please contact the club in advance.